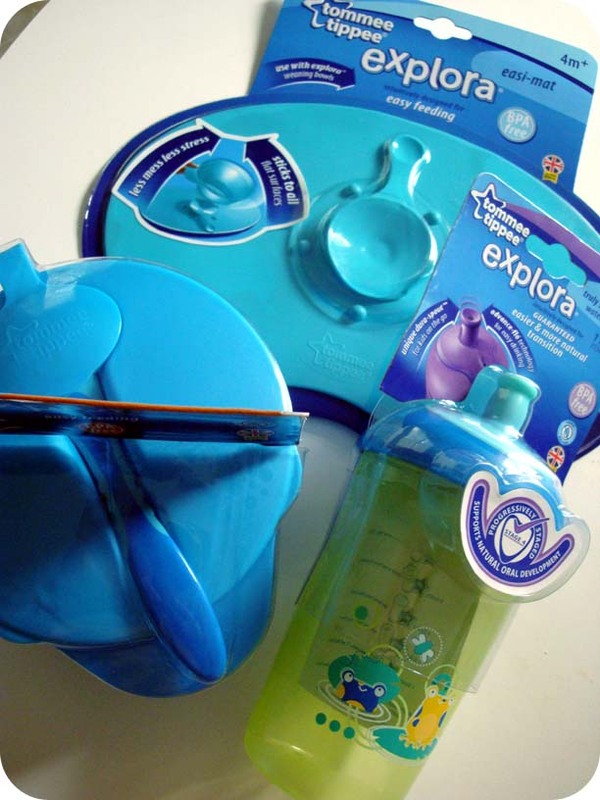 Today I am reviewing Tommee Tippee infant and toddler feeding products. Tommee Tippee is the number one infant/toddler feeding brand in Great Britain, so I was super excited to try out this line as it has only recently become available in the U.S.
We recieved a no-spill cup, feeding bowls with spoon and a non-slip mat from the Explora line to review. When I decided to do reviews on this blog, I knew I had to be completely honest about what we try out. So if you are looking into trying out these products, here is what we think! Good bad and ugly! Ok, there really isn’t an ugly. Ok now this is the product that I wanted to LOVE. I think it is such a fabulous idea and we have been having some trouble getting Oscar to leave his bowl or plate on the table. This mat is intended to be used with the bowls and basically they suction right onto the mat. The mat is made of silicone so it stays put and the bowl is stuck to it. It is a REALLY strong attachment but Oscar was still able to get it off. Overall, I was very pleased with Tommee Tippee and we will continue using them. Their products can be found at your local Toys’R’Us and Babies’R’Us stores as well as online at Babiesrus.com. And through July 23rd, if you buy any Explora item, you can get 50% off the second at Babiesrus.com! To get the latest updates on Tommee Tippee and what they are doing next, follow them on Facebook and Twitter! Thanks for reading! Disclosure: I was given the above items to review through Mom Bloggers Club. All opinions in this post are my own and are not in any way influenced by Mom Bloggers Club or Tommee Tippee.